We are a leading Manufacturer of pneumatic sealing machine and flameproof pneumatically operated bag sealing machine from Mumbai, India. Pneumatic Sealing Machine. We are one of the noteworthy enterprises engaged in offering superior quality Pneumatic Sealing Machine. This is a newly developed product with improved automatic continuous sealer and gas filling mechanism. Mainly used in the packaging of puffed food, the machine fills the bag with gas before sealing to inflate the bag in order to protect goods during shipping. 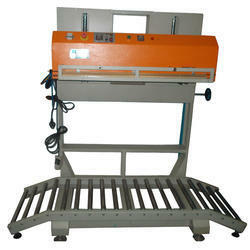 The offered machine has sealing speed of 0-12m/min, and the width is 6-12mm. Apart from this, the offered machine is made available at cost effective rates. Flameproof Pneumatically Operated Bag Sealing Machine -We are counted amongst the recognized organization offering of premium quality Flameproof Pneumatically Operated Bag Sealing Machine. 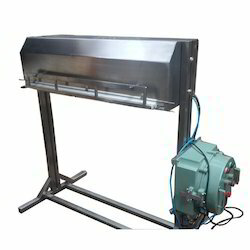 This machine is equipped with maximum conveyor load of 1 kg to 25-100 kg maximum, Indian make, signal speed, temp- select make, 1.5-2 meter convener, and sealing head adjustable up-down motion. Furthermore, at our manufacturing unit, our engineers have designed the machine adhering to international industry standards and using heavy cast material. Besides, clients can get the machine from us at industry leading prices. flame Proof panel with foot switch.